I found myself with my pinky permanently glued to the control key when I was editing existing code. Does everyone else ignore the tutorial and use the arrow keys instead of C-[npfb]? I'm stuck with FreeBSD 4.7 in a certain programming environment, and Emacs there didn't come with Python support at all! In contrast, with the exception of brand-new languages like Io, there's a mode in Vim already installed for almost every programming language I've ever used (e.g. Haskell, OCaml, etc.). When committing a CVS file, it didn't make use of my CVS/Template, which is a must for my programming situation. Being compulsive obsessive, it was a bit irritating having a buffer in my buffer list for everything. I far prefer just having a buffer shown for each file that I'm actually editing. I like to permanently close buffers, but this seems to be discouraged in Emacs. I'm sure this is just a matter of workflow, and it doesn't really matter. To be fair, I've customized Vim to show my open buffers along the top, like tabs. The thing that broke the camel's back was when I noticed how nicely Vim syntax highlighted a diff I was reading. I then tried the same thing in Emacs, and it didn't syntax highlight at all. I'm sure it can do it, but it didn't by default. As an aside, it's fair to say that neither Emacs nor Vim is especially user friendly. That's true. However, for me personally, since I edit text all day, everyday, I'll choose whatever is most powerful for the type of editing I do. Since I do this everyday, the initial learning curve is less important to me. You know at least 20 hotkeys in each editor you're arguing about. You approach the argument with an open mind. You have coded for at least 2 months in each editor you're arguing about. > tutorial and use the arrow keys instead of C-[npfb]? I use the arrows, but I also have caps-lock mapped to ctrl. Don't you? > ever used (e.g. Haskell, OCaml, etc.). require tweaking to get the way you like them. > which is a must for my programming situation. > buffers along the top, like tabs. > it _can_ do it, but it didn't by default. that claim about emacs in general). I'll give you a demo sometime. > the initial learning curve is less important to me. > - You know at least 20 hotkeys in each editor you're arguing about. > - You approach the argument with an open mind. > - You have coded for at least 2 months in each editor you're arguing about. arguing, I think you *should* use vi. * You absolutely must swap Ctrl and Caps Lock. * I do use c-[npbf]. * Use mmm-mode for multi-lingual syntax highlighting. I wrote the mode for Myghty. It turns out my diff wasn't highlighted because I hadn't turned on syntax highlighting. I am pretty experienced at both Emacs and Vim. I tend to prefer Emacs for development, and Vim for configuration files and system administration. Emacs does have multi-mode support, but it's a pain to set up; vim clearly wins in that area. However, for me, multi-mode files are a code smell; if an HTML file has more than one expression worth of Python in it, or a Python file has more than one tag worth of HTML, I find that there is some kind of design mistake happening. The real killer feature of Emacs that makes it the clear winner for development is the ability to asynchronously run processes and interact with buffers. Being able to jump between an active PDB session and the real editor for the source files involved is really helpful for visualization. Also, my unit tests take a looong time to run. I really like being able to whack the "unit test" key and keep coding. In some absolute sense, Emacs is more powerful and Vim is faster. It depends on what you need - if your code involves editing groups of small files, in different languages, on different systems, then Vim is far better; working with Emacs in that environment leaves you spending most of your time waiting for the editor to start. In the opposite case, where you are working with large numbers of large files, in a big system, the implied workflow you noticed (wanting to keep lots of files open at once, wanting to keep the editor running) is a help rather than a hindrance. All the stuff you mentioned I noticed JEdit already has. And JEdit is much easier to use since it has a GUI. Just download some plugins like buffertabs, jython/jruby addins, console addin, jdiff, etc. I think I fulfill the requirements, so I'll throw in my € 0,02. I actually love Emacs' keybindings. That's because I use a custom keyboard layout (kind of like Dvorak, but designed for the German language), which makes Vim's h/j/k/l navigation completely useless (it would be u/p/y/e on a QWERTY keyboard). They're also consistent, which makes them easy to remember: C-f = forward-char, M-f = forward-word and so on. Even if you don't know some particular keybinding, you can use M-x to run the command by name or use tab-completion to discover new features. 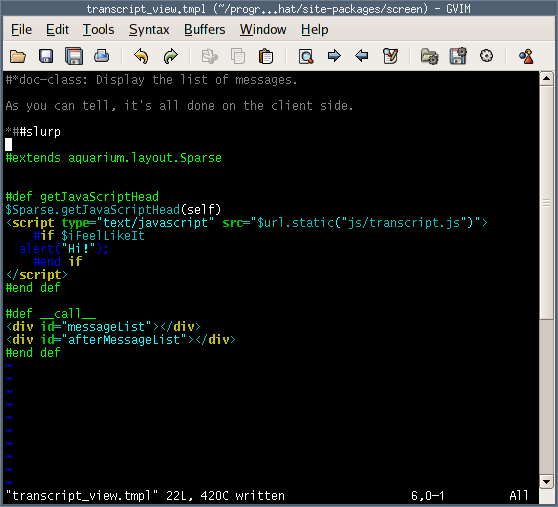 That said, Vim's syntax highlighting really is a whole lot better than Emacs'. But what really annoys me is Emacs' complete lack of proper text rendering. I mean, which century is this? Antialiased text is a must for my bad eyes, and Emacs doesn't provide it (except in Mac OS X, of course, but regarding font rendering that's in a whole different league altogether, anyway). I find both editors' handling of multiple buffers horrible, by the way. I'd love to have a nice, graphical tab bar as well as a tree view of my project. I know of Speedbar and tabbar-mode for Emacs, but they're ugly and not really usable. 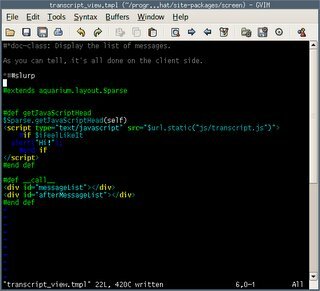 Do you know of a good solution for Vim, by chance? jEdit has got tabs and a graphical tree view, but its keybindings are terrible, there are no keybinding sets to choose from, and it consumes much more RAM than it should. Its syntax-highlighting support isn't as good as Vim's and Emacs', either. Not to mention the fact that its startup time is even worse than that of Emacs. Oh well... maybe I should go back to using EDLIN.
" Don't require that you save when switching to another buffer. Off Topic: Which Character are You?